Illegal wildlife poaching may be a little out of your radar, considering its rampancy takes place on a whole other continent, but it is definitely an issue that requires urgent attention. Perhaps the gravity of its effects can be best illustrated in the fact that the world's last male northern white rhinoceros is on 24-hour guard in Kenya, as conservationists launch an all-out effort to prevent the last of the species on the planet from succumbing to ruthless poaching. 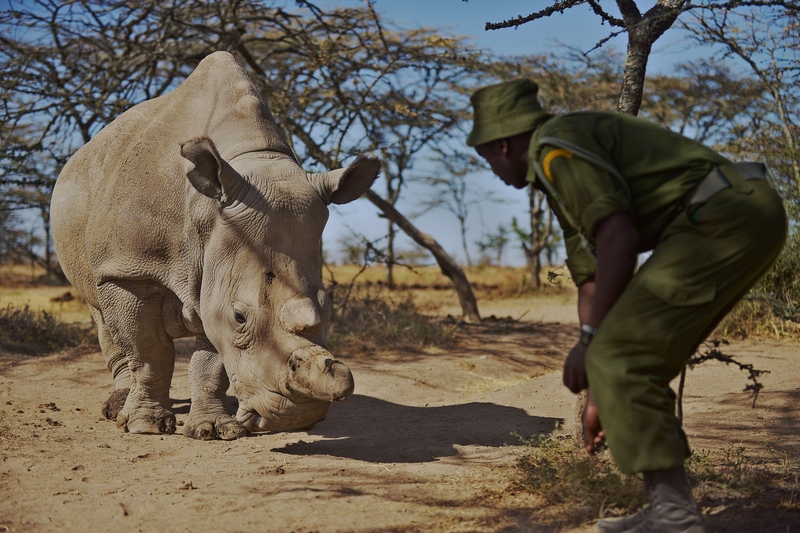 The situation has become so dire that rangers at the Ol Pejeta Conservancy have been outfitted with arms to protect 40-year-old Sudan, the only remaining male of his species, along with two female northern white rhinos. The three of them are among the last five of the species left; two other females live in captivity. On top of the 24-hour armed watch, Sudan's horn has been removed to lessen his appeal to poachers, and all three rhinos at the game conservancy are fitted with radio transmitters, The Huffington Post reported. The species has survived for 50 million years, but now its numbers have been reduced to a sorry handful, thanks to poachers who kill them for their horns. Often used for unproven medicinal purposes, rhinoceros horns, if ground up into fine dust, can fetch up to a staggering $75,000 per kilogram. We often find ourselves in the line of fire to protect animals — it's part of the job, especially while foiling attempted poaching attacks. Lacking funds to equip the rangers with arms to protect both themselves and the animals, Ol Pejeta Conservancy created a GoFundMe campaign to raise money to provide its rangers with equipment and wages. The campaign has so far raised slightly more than $22,000 of its $110,000 target. In South Africa, over 1,000 rhinos are being poached each year — 1,215 rhinos there were killed by poachers in 2014; one every eight hours — yet the country, sadly, is considering legalizing the sale of rhinoceros horns, The Guardian reported.